1. Elisson presents WEEKEND WITH BERNIE posted at Lost in the Cheese Aisle. 3. Mister Crap presents Visitor posted at 100 Word Stories. 4. Nikita Cat presents Tortie Tuesday: Look Into My Eyes.... posted at Meowsings of an Opinionated Pussycat, saying, "She, Who Will Be Obeyed....Hee, hee! ;-D"
5. Nikita Cat presents Daddy Kiril Purrfectly Delighted With Survey Reward, Fur Sure! posted at Meowsings of an Opinionated Pussycat, saying, "Daddy takes a pet related survey, and wins a prize. I find a post on the surveyors blog that, in some ways, is related to the subject of the survey." 9. Friends Furever presents Ellie and Allie at The Florida Furkids and Angel Sniffie! Next week's Host will be US Again!! 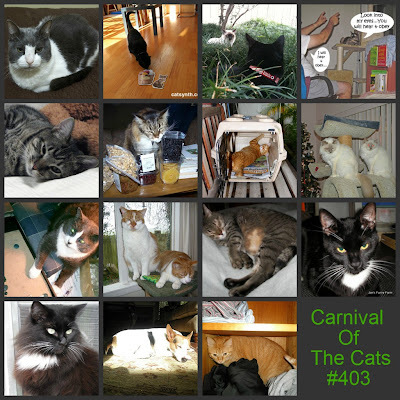 Have a wonderful week and thank you for Participating in this weeks Carnival Of The Cats #403! 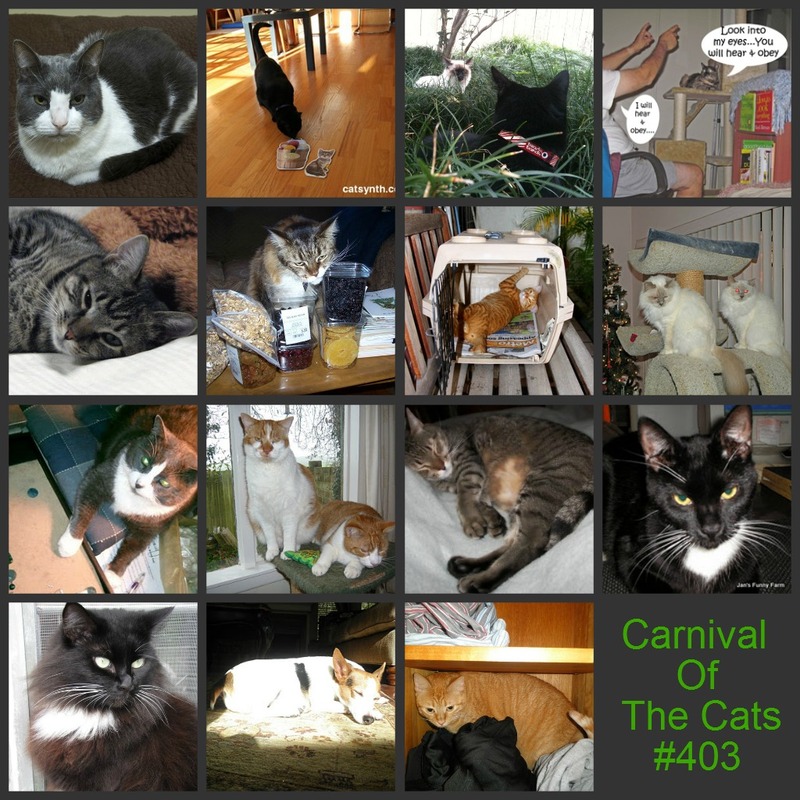 The pictures are in order of this week's Posts! What a great carnival. Thanks for hosting - it looks like lots of work too. Yous guys did a fubulous job! Nice! I'll be busy for a while going through all those links. Happy holidays!